Tonight was returning guest, author and ufologist Nick Redfern. Henry repeated the news about the upcoming Hill-Con at Haunted Hillview Manor. event September 26th. Henry also spoke about Mid-South Kentucky being held July 21st-23rd, and Hill-Con or such at Hillview Manor in New Castle, Pennsylvania, on September 23rd. Henry had Nick explain aspects of the 1947 Roswell incident, considering Nick's new The Roswell UFO Conspiracy: Exposing A Shocking And Sinister Secret book. "Tabby" Cat Gasch in the live chat room asked about why "the" government withholds the probability of proof of aliens. Nick suspects that it's to keep such out of unfriendly governments' hands, such as North Korea, as well as economic issues: power sources that could replace oil and such. Hwe also spoke of Fort Stanton, close to Roswell, and Randy Lovelace. Via Skype chat, CC reported our having listeners tonight in the US, the UK, Canada, Singapore, Malaysia, Australia, and Unknown. 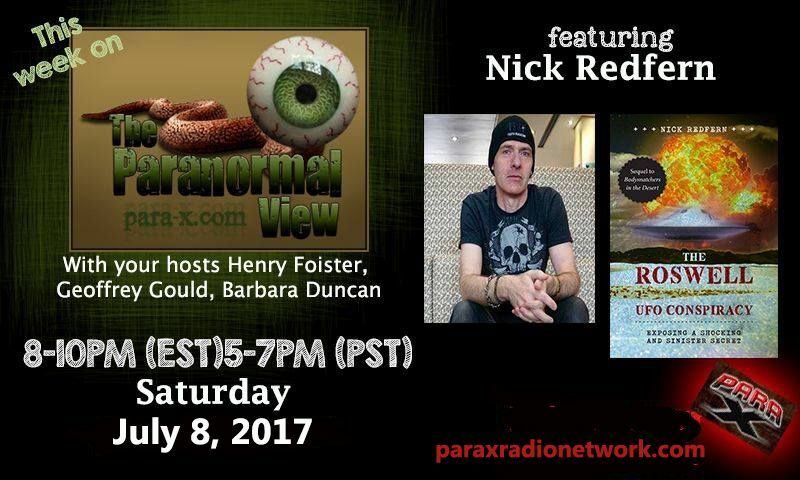 08 July 2017 edition of The Paranormal View.